Encouraged by this post on the Good Pens blog, I finally gave it a go and refilled a Pilot Varsity. Using needlenose pliers, you can just pop the nib bit out, dump out any unused ink, and fill with a much more exciting color. 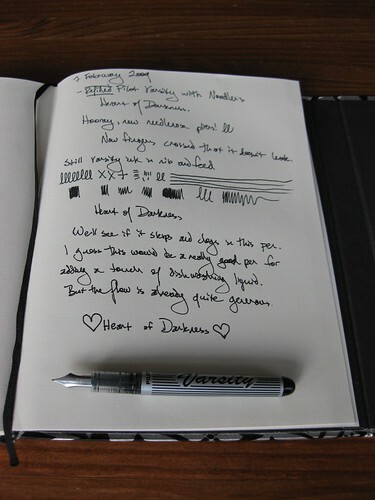 I wanted a nice fat line for my Noodler's Heart of Darkness, so this was a perfect fit. I address most envelopes with Heart of Darkness because it is so very black and also waterproof, so this is now my go-to pen for that purpose. I didn't rinse the nib, and you can see in the top of the photo how much lighter the Pilot black ink is than the Noodler's black-black-black HoD. Interesting. I've never used a Pilot Varsity. It seemed so wasteful, but maybe with this information, I might try one, if I can find one. I have a favorite fountain pen, but it leaks ink all over my fingers, so I haven't been using it lately. Can't really afford to send it to the hospital, so I either use other pens or put up with blue fingers. Oh, bummer about the leaky fountain pen. That is such a disappointment. When working properly, the fountain pens shouldn't leak... but I hear you about not being able to afford to send it to the hospital. I agree about the wastefulness of disposable fountain pens - but they become a great deal, and a great resource, when you realize you can refill them!